Canadian government has decided to send troops to Ukraine in a non-combat role, CTV News reported, citing official sources. The troops could arrive in the country in the coming weeks or months, but the details of the mission are still being worked out. 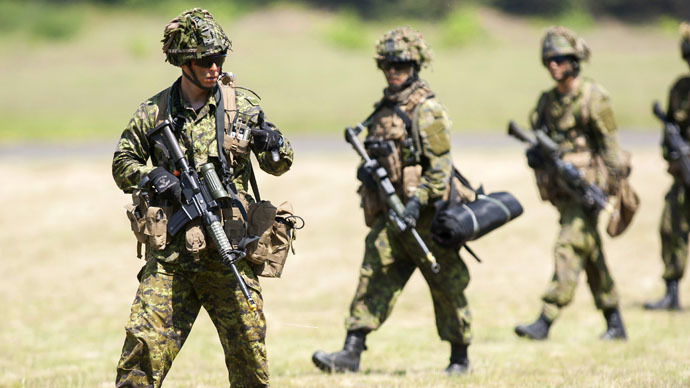 The Canadian soldiers are likely to be sent for a training mission and could cooperate with American soldiers, the report said. “While the government is still working out the details, sources told CTV News a training mission is one of the options on the table. Canada is likely to work closely with American allies who are already in the region,” CTV News reporter Mercedes Stephenson said. The Conservative government has been leaning towards a more significant Canadian involvement in the Ukrainian crisis for the past few months. In February, Canada updated the list of its sanctions against Russia with travel bans slapped on 37 Russian and Ukrainian individuals. It also applied economic sanctions against 17 Russian and Ukrainian companies, which included Russian oil giant Rosneft. In December, Canada signed an agreement to send its military police to Ukraine to “look into the possibilities of cooperation,” while it also looked to help the government in Kiev with security issues. Meanwhile, Canada’s Toronto Symphony Orchestra (TSO) barred a Ukrainian-born pianist from playing in a scheduled program for expressing views on the situation in Ukraine via Twitter. The orchestra dropped pianist Valentina Lisitsa who was due to play a concerto by Rachmaninoff. The hashtag #LetValentinaPlay surged in popularity on social media, and thousands of supporters spoke out for the artist, who was offered to be paid not to play.